The promotion of food and drink high in fat, sugar and salt is to be restricted in Scotland, ministers have confirmed. The Scottish government plans the move as part of its new diet and obesity strategy to help people lose weight. Ministers also want to see the broadcast of TV adverts for unhealthy food banned before the 21:00 watershed. TV chef Jamie Oliver, a prominent campaigner for healthier eating, described it as “trailblazing” and urged the UK government to follow suit. He said: “This is an amazing step towards making sure the healthiest choice is the easiest choice – for everyone. “Today, Scotland has set an example to the rest of the world. It has picked up the baton that Westminster dropped last year. So, now the ball is back in the UK government’s court. Public health minister Aileen Campbell said obesity “significantly increases” the risk of developing conditions like diabetes, heart disease and depression. Ms Campbell launched a consultation on the plans at Tynecastle Stadium in Edinburgh, where she met participants in the Football Fans in Training programme. She later told MSPs that the government was putting forward “bold” measures which would “make a real, lasting difference to the country’s health”. These include plans to restrict price promotions on food and drink high in fat, sugar and salt in areas around visitor attractions and on routes to schools, and £40m of investment to deliver almost 100,000 “supported weight management interventions” for people with or at risk of type two diabetes. Ms Campbell also said that if the UK government did not commit to banning TV adverts for unhealthy food before the 21:00 watershed, the Scottish government would ask for powers to be devolved so it could do so itself. The SNP MSP said: “Simply put, it’s harming the people of Scotland. It also puts pressure on the NHS, other public services and our economy. Health and retail organisations broadly welcomed the consultation, alongside opposition parties. Cancer Research UK said it was “great to see a range of bold proposals” in the strategy, saying that Scotland has been “in the grip of an obesity epidemic for far too long”. The British Medical Association Scotland said “ambitious” action was needed “across every part of society in Scotland if we are to successfully reduce levels of obesity in future years”. The Scottish Grocers Federation said “clamping down on promotions” was “too blunt an instrument to really impact on consumer behaviour”, but welcomed the consultation and said the key role retailers had to play would be reflected in their response. 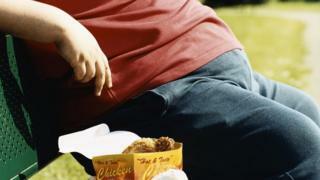 Scottish Conservative health spokesman Miles Briggs said efforts to tackle obesity “could not come soon enough”, stressing the need to work across parties and portfolios to do so. Scottish Labour MSP Colin Smyth said the “obesity crisis is the single biggest public health challenge facing Scotland today”, and said “bold, radical action is very much needed”. The consultation on the diet and obesity strategy will run until the end of January 2018.